Christmas is one of those topics that people feel strongly about. If you love how your family does Christmas, great. Keep it that way. If you’ve been wanting to make some changes, this is the time to do it. Summer is over. Most people haven’t started their Christmas shopping yet. You want to talk to your family before they start making Christmas plans. My extended family is steeped in tradition. Changing anything is nearly impossible. When Brian and I moved overseas for nearly 5 years, our family understood that we weren’t going to be there Christmas morning. When we returned, it was expected we do the same thing we’ve always done. We wanted to make some changes and one of those changes was simplifying the whole season. One of the best ways to save money at Christmas is to simplify. For us it meant buying less stuff for fewer people. Our purpose wasn’t to save money although in the process we did. Our purpose was to create the kind of Christmas we wanted to have rather than just doing what we’ve always done. 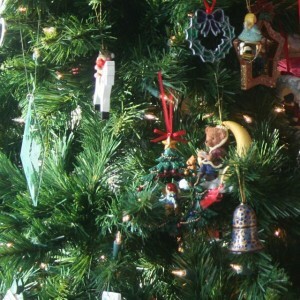 Here are some ideas for simplifying Christmas. 1. Consider only buying gifts for kids, your partner and your parents. This was one of the first changes we made. Now instead of buying for our brothers and sisters and their partners, we buy only for their children, our children and for our parents. Suggesting this in early December sounds cheap and lazy. Suggesting it in September or October sounds wise. The complication in this one is for the people who don’t have a partner or children. You will have to set the ground rules for your own family as well as the cut off age for kids. 2. Consider a smaller gift for your own kids. This one really depends on the size of your extended family and how many gifts they receive at Christmas. Our extended family is huge and our kids get lots of gifts at Christmas. We only buy one gift for each of our kids (and one gift from Santa). Christmas morning doesn’t have to be about the quantity of gifts. For us, it’s about being together and showing our love and appreciation for one another with a gift, not a pile of gifts. 3. Try a family gift instead of a gift for each person. If you do buy for lots of nieces and nephews you may want to consider a joint gift. Perhaps a family board game, a DVD set or tickets to an event. It simplifies your shopping and it’s something the whole family can enjoy. 4. Give the gift of experiences. For the family that has everything, is trying to downsize or lives a simple life, experiences can be a great gift. Try a museum pass, a gift card for movies and popcorn or tickets to a play or concert. 5. Make it a pot luck. This is one of the best changes our family made. My parents would buy and make all the food. It was exhausting for them. Now we bring the side dishes, my sister-in-law makes dessert and my parents bring the turkey. It makes it more relaxing for everyone and it saves money when you only have to purchase part of the meal. I love spreadsheets. My life wouldn’t be half as organized without my trusty google spreadsheets. Every year I set up a Christmas spreadsheet. This way I can keep track of whose gift I’ve purchased, who is left on the list and any ideas I have for gifts remaining. As soon as the gift is purchased, I highlight the column and it’s easy to see what is left to buy. I really dislike shopping, especially shopping in crowds wearing a winter coat walking through a hot mall. I will do anything to avoid the mall in December. I try and get most of my shopping done by December 1st and when I can, I shop online for gifts. Many places have free shipping around Christmas. Others offer wrapping and will even fill out a card if you’re having it shipped directly to the recipient. This one probably won’t work if you have children. One year, I’d love to spend all our Christmas money on a resort vacation with the extended family. My favourite holiday is Thanksgiving. It has the same people and the same food but without all the stress of buying, wrapping, finding and returning gifts. It’s not to early to simplify Christmas this year. Now is the time to talk to your family. If you’ve found ways to simply Christmas, share with us here. How did it go when you first brought it up with your family? I stopped exchanging gifts with my parents/siblings a number of years ago. It had got to the point where we were just telling each other what to buy which I thought was pointless. 1) Each person only buys presents for *immediate* family (spouse, siblings, parents, children). Not cousins, aunts, uncles, grandparents, in-laws, etc etc. 2) Food and drink responsibility is divided across everyone – i.e. pot-luck the food, then someone else must get the wine, another person the beer, another person the whisky etc etc. 3) One additional secret-Santa present per person – in addition to the guidelines in step 1, we each draw a name out of a hat and buy that person another present, worth a fixed value (e.g. $50). Every so often, we forgo this and use the pool money to fund something else, e.g. this year we’re spending Xmas week in a cottage in the country. One year we did a secret Santa kind of idea amongst the non-children relatives instead of getting something for everyone, and that worked quite well. Now, we only buy gifts for the children. But I do have a sister who has no kids, and so I always buy one extra gift for her – it doesn’t seem fair to me that she has to buy gifts for everyone and gets nothing herself. Food also tends to be divided, although somewhat unevenly as some people are great cooks and others can only contribute store bought goods. The “family” gathering (brothers, sisters, in-laws, etc. and anyone visiting from out-of-town) get together on Christmas Eve for pot-luck appies. Everyone brings some form of finger-food, and their own choice for beverage. It is buffet-style, and is non-stop food all evening. The gift exchange is between families. We mix it up, but mostly give to the kids (nieces/nephews) and one gift per family household. Christmas morning is spent with your own individual family as that is quieter and you can do the Santa thing. Then Christmas dinner is at a different house than the Christmas Eve gathering, an organized pot-luck. Boxing day afternoon/dinner, everyone gathers at a different household with all of the leftovers. This is a great occasion, too, as there are usually friends dropping by, or coming with the other family members, and it is more casual as there is no “gifting”, just lots of bragging! This has worked well for us for over 20 years. This way, there are no hard feelings if someone needs to opt-out to meet with their other extended family (in-laws or out-laws) as they can usually squeeze in one of the 3 days for a visit! In my large family (excluding inlaws, which are a small but separate affair) I have 4 nieces, 1 son, 3 siblings, 2 parents plus assorted wives/husbands and like other posters, the kids get something and then each ‘couple’ gets a family gift, and we play cuthroat santa. It’s always the highlight of the season, to see who can get the worst gift and who gets the best. Four Pillars: We are finding the same thing in our family? Did they agree right away or were some people less willing to change then others? Russ: Love the idea of the family spending the week at a cottage in the country. Now that’s my idea of Christmas! Geoff: What is cuthroat Santa? You have my curiosity. We try to ensure the gifts are truly needed / wanted, rather than just being some trinket or other. We have also made charitable donations — last year my Father finally “got his goat”, it went to the third world as part of a farm program. Now that I have kids it’s a lot easier since they can just buy something for the kids which works out quite well. When my family switched to a “immediate family only + secret santa” system, it made things a lot easier and less expensive. At that time we also added a chinese gift exchange, where each person brings one small gift under $10, and they are all placed in the middle of the room, with no labels. Everyone draws numbers to determine order. On your turn, you can either open a new gift from the middle, or steal a gift from someone else (who then can choose to steal or open). We usually put a limit on how many times a gift can be stolen, to stop endless chains of theft. The person who goes first has to open, but can choose to steal at the very end. Typically these small gifts are decorative and Christmas themed, such as tree ornaments. Boxes of chocolates are also popular. The whole thing is a lot of fun, and it doesn’t matter if some of the gifts are more popular than others, because nobody knows who brought the gift! The last thing many people want to do is shop after Christmas, but the post-Christmas sales are definitely the time to buy cards, ornaments, etc. If the Boxing Day crowds are too awful to contemplate, waiting to January makes things even cheaper, if sometimes more scarce. All good tips, although I’m sure most of us wouldn’t want to skip christmas. Despite all the hassles and shopping, most of us still love christmas. Limiting gifts for children can be a problem too. You know the kids are going to go compare what they got with their friends. If they get a much smaller haul than their friends, it could lead to bitterness towards you. Kathryn – post # 9 basically described it, it has many names and many rule variations. We make it a little more evil, where the first person basically gets screwed over and the highest numbered person gets the pick of the litter. We also don’t allow ‘re-steals’ — ie if I’m # 2 and open up a gift I don’t want, I can keep it or steal the gift from # 1, and they get the gift I just opened, too bad so sad. It’s really interesting to see what happens. More often than not, people are satisifed with what they get. Even #1 has in previoius years just picked a gift that no body else wanted, but they did. but another great one that my family and friends have been doing is just either doing a secret santa – picking from a at the name of the person you’re going to buy a gift for, or doing an elephant gift exchange – it’s basically a game – you guy a gift (whatever it may be – could even be a joke type of gift) and pay it with the family or with friends. these are great because you have fun and at the same time you don’t have to stress out about buying gifts for everyone. I like your tips! I especially like #3 since we have a large family. Our Christmases have been very traditional. After reading your post and the comments, it gave me fresh ideas on how to celebrate this season with a different outlook and style. I will surely take some of your advice. More than the idea of saving, we will be doing this for the fun of celebrating a different Christmas this year! Great post and comments!! Lots of ideas to hopefully mix it up this year. One challenge I have is when the in-laws want to do an expensive “secret” santa since they’ve got a much higher income … also it’s now to the point where my sister-in-law sends the link for the exact gift she wants … definitely doesn’t feel like the “Spirit of Giving” anymore … gotta change things up!! Not only are handmade gifts affordable, but people really do appreciate them. If you have to play the part of Secret Santa at your office or among your family members, look into cheap handmade gifts that you can make or buy for reasonable prices. Haha try to tell my girlfriend we are “skipping” Christmas and that would be the end of that! I definitely set a budget for each person I plan on buying for, and do it well in advance. I don’t have kids yet (marriage is on the horizon, tho), but I can imagine how hard that would be with budgeting and all. I like your tip of giving an experience. We have a great museum here that usually has some big exhibits (Titanic exhibit right now) that’s something like $20. It could be a great gift for a family member, and probably less than you would have spent on a physical gift. I hear you on that – but what you can do set the rules first – say maximum present has to be $50. And also before anyone put their name in the hat – they have to write down 3 things they’d like to get for x-mas. :) Maybe even set a theme with a quote about giving and being thankful for what they have – something of the sort to get people to be more humble. My family does a “Dirty Santa” game each year and buy just for the kids. All the adults (who want to participate) will buy 1 gift of a $20 value, then we all draw numbers. We go in numerical order starting with #1 picking a gift & unwrappingit. The next person can either take someone elses or choose a new gift. We all have a lot of fun and there is always that 1 gift everyone fights over. Then for the dinner everyone brings a side dish &/or dessart & my parents provide the main meat, usuall turkey. We do the same for Thanksgiving dinner & it makes it so much more relaxing for everyone, especially my parents. We did something like you did for our kids a couple of years. We tried to instill into them that they are very fortunate and that there are so many people who are truly desperate. So, while we did give them some presents, we took about half of the budget for them and made contributions to World Vision on their behalf to pay for shipping of medicines, clothing, etc. and some livestock. Last Christmas, their grandma did the same instead of sending gifts to them. We’ve also worked with an organization that tries to match a ‘Santa’ with a needy family. But, my wife was insistent that we simply don’t hand over a cheque… we bought all of the items ourselves (e.g. baby clothes, toys, a little something for the mother) and also pitched in some money for formula, food, diapers, etc. AND, we actually delivered them to the young, single mother. It was quite a shock – there she was in an apartment with family who were busy smoking and drinking. It left us wondering about what chance the young mother and child would have to become independent (and healthy). It also made us wonder if dear ol’ mom and dad might use some of the money for themselves based on their attitude with us. We always volunteer at the food bank but you still are sheltered from the real hardship since we are in a warehouse sorting food. I’m sure we would be more involved if we had to face those in need constantly. My family is so very insulated in the world from true hardship.